Renovado com um toque moderno, mantendo o charme Cape Cod, o '' Chateau '' vem totalmente equipado. A cozinha é completa com panelas 'n panelas, pratos, tigelas, travessas - o nome dele, ele está aqui ... tudo até o pote de lagosta! O quintal tem uma nova grade do gás Lynx e um grelhador a carvão Weber disponível para suas atividades para churrasco. coisas que você precisa para trazer são os seus lençóis, toalhas de praia e trajes de banho! Dennis é o lar de 18 belíssimas praias de Cape Cod, o nosso favorito local Sea Street Beach é um curta de dez minutos a pé da praia direto com ½ milha a partir da porta da frente para Depot Street Beach. Para você golfistas, trazer seus clubes para bater-se Dennis Pines e Dennis Highlands ... outro favorito sendo Cranberry Valley, na porta ao lado Harwich. Interessado em um dia de viagem para a Ilha? O ferry Harwich Port-Nantucket é apenas uma milha abaixo da estrada. 5 milhas do centro de Chatham para uma tarde de compras. Outras atividades incluem karts, mini-golfe, lojas knack knacks, aluguel de caiaque, e muito mais. Para ajudar a minimizar o tráfego e obter o verdadeiro "Cape Cod" nós decidimos oferecer arrendamentos de segunda-feira a segunda-feira. Esperamos que isso vai ajudar com certos convidados que só são capazes de desfrutar o fim de semana - desta vez em pleno; eliminar a unidade de tráfego volume de negócios sábado para baixo; e deixar você aproveitar o nosso favorito domingo à noite pós-festa do pijama praia churrasco para sua última noite de estadia antes de voltar para o escritório na segunda-feira! We stayed at the Chateau, July 2017. It is a very nice, well appointed home in a great location. It easily accommodated our extended family,and had a great fenced in yard for our 2 Golden Retrievers to roam around. We have rented several properties on the cape over the years, and this home certainly fits in as one of the best to date. We would consider this home again in the future. We also had the opportunity to meet the owner, Carolyn and found her to be very helpful and friendly with info about things to do in the area. Thanks Vince, I'm happy you enjoyed your stay at our Happy Place! Best week on the cape ! We just had a really great week at The Chateau- the only bad part was that we had to leave! Everything was handled very professionally and we had lots of good advice and tips. 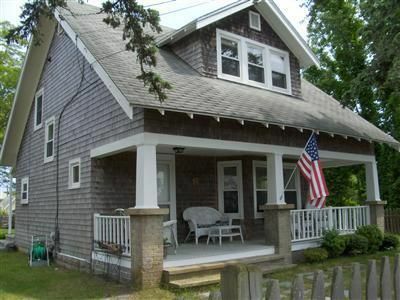 This is a great house in a great location and has everything you would want in a cape house. We could walk to get coffee, meals, cocktails, beaches and it was also in a great location to travel to other areas of the cape. Beautiful yard, front porch for relaxing, plenty of space for everyone to enjoy vacation. We loved riding our bikes around town and to the beach or to get muffins in the morning and cookouts in the backyard and outdoor shower! Everything was clean and well kept . We will most definitely be back again next summer and hope we have started a new family tradition!! Thank you for sharing your house with us! This was our first experience renting on the Cape as our family has owned a home for 15 years in west Yarmouth but sold in late 2015. The home is beautifully kept and fully equipped with everything your could need. The owners were wonderful keeping in touch leading up to and throughout our stay. The location can't be beat. We would highly recommend renting le chateau. My family and I stayed at the Chateau in September 2015. We had the best vacation week. Carolyn did a great job sending emails with tons of useful information on places to visit, places to eat, sights not to miss etc. The location was perfect. Great restaurants within walking distance along with beaches and shops. House was beautifully renovated, great kitchen for cooking, although we mostly ate out as we were on vacation! We brought our dog and he had the best time. The yard was great, fully fenced in and very large. Carolyn was so attentive to our family needs, she even left out a crib for us to use for our son. Everything was perfect. There is a binder with information on each village and town along the cape with restaurants, attractions, beach locations and costs. We loved our stay at the Chateau and can't wait to return again. We had an absolute blast - the house is beautiful and perfectly set up. The yard was even bigger than we thought, and the fence was perfect for our dog. There wasn't a single thing to improve upon - we had a great time and everyone commented on how beautiful the house was. I was amazed at how much is down that end of Dennis (we've always stayed up by Mayflower), and the book of suggestions was invaluable (as were the emails, which I referred to daily when planning our next destination). I had searched rentals for weeks trying to find the perfect place - and I have absolutely found it. I had a great time staying at the Chateau. The description is 100% accurate in regards to the house itself and surrounding sights and things to do. Property was spotless and well stocked with the necessities. I would definitely recommed this rental to families or adults only trips, The Chateau accomodates everyone. The beaches are beautifulk and easily accessible from the Chateau. Rates are subject to change until reservation is confirmed. Advance reservations for July & August accepted only for 7-night stays only (Mon to Mon); shorter stays possible if available 3 weeks prior only. All checks must be made payable to "172 Depot Street LLC" and mailed to owner's home address off-Cape (to be provided via email).